The Cardiology department at Dr.SMCSI Medical College Karakonam is well equipped to deal with all heart problems.24 hours service is available on all days. We have a resident Cardiologist in the hospital campus. We have Outpatient department on all week days .On call service is available at any time .The cardiology In patient ward can accommodate 20 patients. The Cardiology Intensive Coronary Care Unit can admit 5 patients and if fully equipped with Cardiac monitors, Ventilators, Cardiac Defribrillators, Pulse Oxymeters and facility for Temporary Pacing. We have 24 hour ECG service .The Treadmill lab is fully functional on all days and we also accept request for Treadmill test from other hospitals. The Echo-Doppler machine is high quality and this lab is often utilized till evening on all days .We also consider request for Echo- Doppler study from other hospitals. We have latest third generation Cardiac catheterization lab to provide quality Diagnostic and Interventional procedures .We undertake all Cardiac Catheterization procedures including Coronory Angiography, Coronary Angioplasty, Peripheral Angiography and Angioplasty, Temporary & Permanent pacemaker procedures. Being a charitable and educational institution all the services are provided at a lowest cost. The co-ordination between other departments and management are admirable we get all help any time. 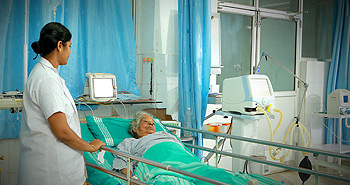 We have sister trained at reputed Cardiac centers working in Cardiac Cath Lab. We undertake classes for Undergraduates, DNB, House Surgeons and Paramedical course. We conduct Seminars, Medical camps and CME programmes periodically.